Let’s face it, boiled or steamed hot dogs are “ok”, but nothing truly beats the taste of a delicious grilled hot dog. No reason to fire up the barbecue grill just to make hotdogs though – use your Foreman Grill! In fact, you can grill several hot dogs at a time for your next party of even grill them ahead of time for tomorrow’s lunch for the kids. 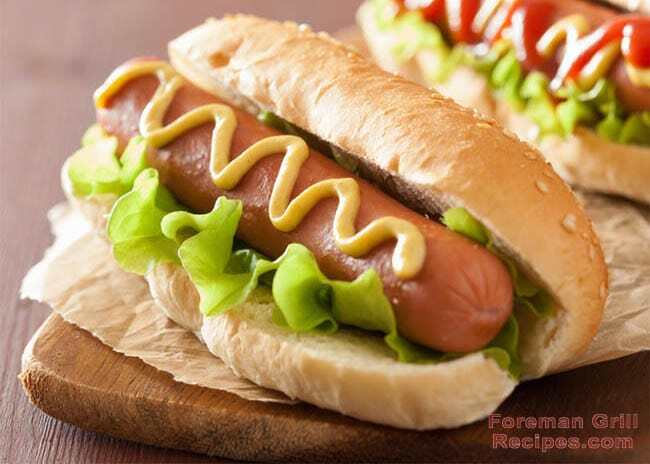 There’s tons of hot dogs available prepackaged at supermarkets or fresh ones from many butchers or delicatessens. 100% pure beef hot dogs are very popular for the grill but any kind will do. Grilling hot dogs on your Foreman Grill couldn’t be easier. If your hot dogs are frozen, make sure to defrost as frozen hot dogs will take too long. Preheat your Foreman Grill for at least 5 minutes with the lid closed. Use “high” temperature setting if you have it. Place as many hot dogs on the grill as desired and close the lid. Most hot dogs are already actually cooked so you can remove them from the grill whenever you wish. Generally you’ll get good grill marks after about 5 minutes. Leave them on for 2 to 3 minutes more and turn during cooking if desired for even grilling marks. Be sure to serve with fresh buns for best taste! Do you have a recipe for brautwurst? Poke some holes in the brats and boil them in water (add a can of beer for flavor) for about 10 minutes. While that’s going on, preheat the foreman grill. Transfer the boiled brats from the pot to the grill, and grill for 5 minutes. This will ensure good grill marks and that fresh grill flavoring.